Sometimes, no matter how healthy a lifestyle we lead, how fit we keep, and how many different fads we try, certain areas of our body just don’t respond in the way we would like them to. Muffin tops, love handles, back fat, bingo wings, double chins, and excess inner/outer thigh fat can be hard to shift through diet and exercise alone. Worry no longer, at Cryozone Health we have the answer to those stubborn problem areas. Not only do we have the Cryochamber, which can burn 500-800 calories per session and help you lose that extra weight, we also have our targeted LipoFreeze treatment. LipoFreeze is a non-invasive body-sculpting treatment, designed to destroy those awkward fat cells in just one or two sessions. It works by controlled freezing of the areas of the body that you would like to tone. Each LipoFreeze appointment takes around 45 minutes, during which time you can lay back on the treatment couch and relax. After a membrane has been applied to protect your skin, special suction cups are applied to the area to be treated. The machine then creates a vacuum to draw the treatment area up into where the cooling happens. The area is first warmed and then rapidly cooled by the freezing temperatures to stimulate the natural process known as Cryolipolysis. Cryolipolysis causes the crystallisation and death of fat cells, without damaging the skin. The residual fatty deposits are then absorbed safely into your body and eliminated via the lymphatic system over a course of four to six weeks following treatment. Aside from the slight discomfort you can experience at the start of the treatment, the overall experience is a relaxing process, with no painful recovery or bed rest, and after just one treatment, can be effective on between 20-40% of fat cells in the area. In just two weeks, you should be able to see the difference! 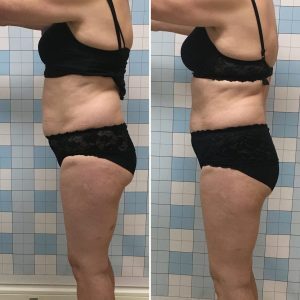 Our fantastic clients have already experienced the amazing body contouring powers of our LipoFreeze treatment, with inches lost from stomachs, bottoms lifted, cellulite reduced and excess fat around the chin reduced in just one or two sessions! Don’t delay, if you are interested in this effective alternative to liposuction, get in touch now!